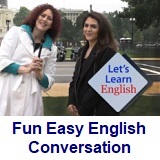 ﻿ Fun Easy English - new american english standard conversation Voice of America VOA learning English for intermediate lesson 25 Only Human discourse. In this lesson Lightning Bolt Lady goes looking for her superpowers. But will she ever find them? And will she ever help...anyone? ANNOUNCER: When last we saw Anna, she had made a new friend. And they had been talking about superheroes for a while when suddenly Anna became Lightning Bolt Lady! ANNOUNCER: She tried to find her superpowers. But it did not go well. ANNOUNCER: She can’t fly, become invisible or create a force field. And she really cannot walk through walls. Ouch, Lightning Bolt Lady. ANNOUNCER: She had been walking into that wall for about 15 minutes when she had a great idea. LIGHTNING BOLT LADY: I just had a great idea! ANNOUNCER: I can’t wait to hear this one! But first, let’s talk about grammar. ANNOUNCER: Professor Bot is on vacation this week. I’m the announcer. So, I’m going to tell you about the past perfect continuous. ANNOUNCER: We use this verb tense to show that an action started in the past and continued to another time or action in the past. 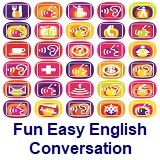 ANNOUNCER: Had been walking is the past perfect continuous of the verb walk. 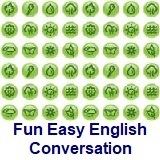 It’s had been plus the -ing form of the verb. ANNOUNCER: You’ll hear me use this verb tense a few more times today. ANNOUNCER: Now, what am I forgetting? Oh right! Lightning Bolt Lady’s great idea. LIGHTNING BOLT LADY: If I want to know my superpowers, I’ll need to learn about lightning! ANNOUNCER: So, she read many books about lightning. LIGHTNING BOLT LADY: Wow. A lightning strike usually lasts less than a second. LIGHTNING BOLT LADY: Lightning is really fast and I like speed walking. So, maybe one of my superpowers is super-speed walking! (to stranger) Bye! LIGHTNING BOLT LADY: Check! Super-speed walking is definitely one of my superpowers. LIGHTNING BOLT LADY: Lightning has millions of volts of electricity. Amazing! LIGHTNING BOLT LADY: Wow! I can charge a lot of batteries with this superpower! ANNOUNCER: She had been looking for hours for someone to help when she found her chance. WOMAN: Hello? Hello? I’m sorry. I’m going to have to call you back. My phone is dying. LIGHTNING BOLT LADY: Excuse me, I can charge your phone. LIGHTNING BOLT LADY: I’m Lightning Bolt Lady! ANNOUNCER: She had been practicing her superpowers all day. Suddenly, she heard a terrible sound – a child’s disappointment. ANNOUNCER: These children tried to light a fire for over an hour. But then, they gave up. PARENT: Hey kids, that wood will never burn. It’is too wet. LIGHTNING BOLT LADY: Small humans, what is wrong? YOUNG MAN: Oh no. It’s you. LIGHTNING BOLT LADY: (to YOUNG MAN:) We meet again. And guess what: I found my superpowers. CHILD: Well, we need a fire to toast the marshmallows to make S’mores. LIGHTNING BOLT LADY: I can help. YOUNG MAN: We don’t need a super-speed walker but thanks! LIGHTNING BOLT LADY: Super-speed walking is just one of my superpowers. I can also do this! LIGHTNING BOLT LADY: Sorry! Let me do it again. CHILDREN: Thanks, Lightning Bolt Lady! LIGHTNING BOLT LADY: You’re welcome. But you don’t have enough firewood. Using my super-speed walking, I will get more. PARENT: Lightning Bolt Lady, come back! A lightning storm is coming! CHILD: Lightning Bolt Lady, are you okay? ANNA: Oh no! I've lost my superpowers! YOUNG MAN: It's starting to rain. Do you want to go inside and eat some S’mores? ANNA: You read my mind. ANNA: You know, I thought mind reading would be one of my superpowers. But it wasn’t. CHILD: That’d be a cool superpower. But I’d rather be able to talk to animals. CHILD: That would be a cool superpower. 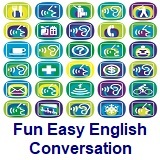 First, read about the past perfect continuous verb tense below. Then, write two or three sentences in the Comments section about an action that started in the past and continued to another time or action. Be sure to use past perfect continuous in each sentence! For example: They had been studying English for two years before they began school in Washington, D.C. They had been talking about superheroes for a while when suddenly Anna became Lightning Bolt Lady! How long had Lightning Bolt Lady been trying to find her superpowers? She'd not been trying for more than a day when she found her chance. Lightning Bolt Lady was happy because she had been using her superpowers all day. The children were disappointed because they'd been wanting to make S’mores. The young man was surprised when Lightning Bolt Lady arrived because he had not been waiting for her. Notice that, with the past perfect continuous, we often shorten the word had with personal pronouns: I’d / you'd / he'd / she'd / we'd / they'd.